This March 18, 2016, get ready for a concert dubbed as "SIKLAB." This is actually a benefit concert show for the Community Extension Office programs, produced by the Augustinian Youth Council 2015-16 in partnership with XFactor Productions, Inc., and directed by Jay Agosto. 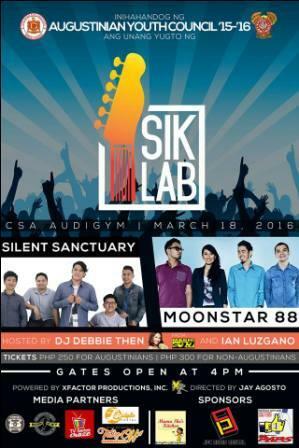 The concert features the hit Pinoy rock bands namely Silent Sanctuary and Moonstar 88. It is hosted by DJ Debbie Then and Ian Luzgano. Ticket prices are Php 250 for Augustinians and Php 300 for non-Augustinians. To avail tickets or reserve your seats to the concert, you may contact us or the XFactor Productions. Media Partners include yours truly The Lifestyle Portal, TV Series Craze, Runner Rocky, TakeOff Philippines, and When In Manila.